American Prisoners of War of the Japanese, possibly from a contingent commanded by Lieutenant Colonel Lewis S. Kirkpatrick (May 15, 1901-April 27, 1943) march East through Barrio San Jose in Corregidor's Bottomside South. Note this ship sunk in the water in the background of the South Dock. They are probably passing Loading Room #3 (Building 328) and Cable Tanks 5 and 6 (Building 329). 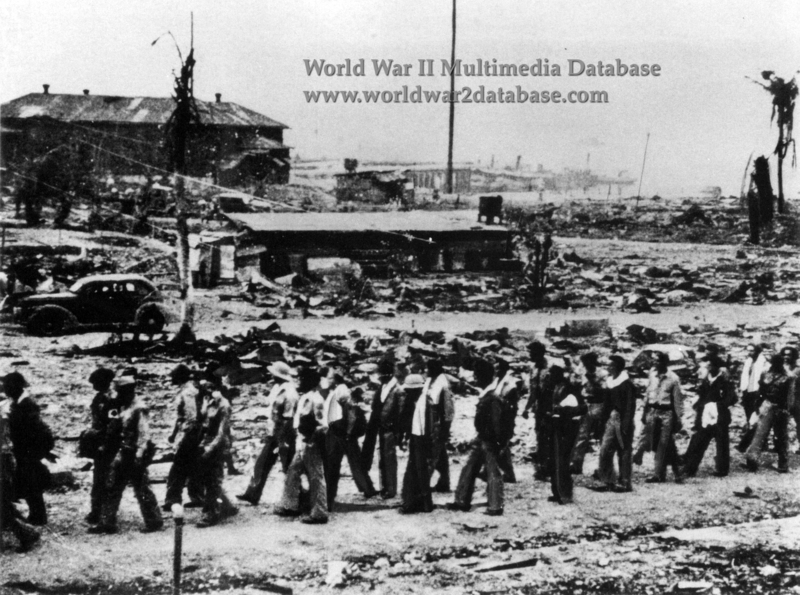 240 enlisted men were left on Corregidor after most Americans were moved to Manila's Bilibid Prison on May 23, 1942. Kirkpatrick, who commanded Fort Drum (an island garrison shaped like a concrete battleship) during the siege, and an additional 75 officers and men arrived on June 7. they were all technical specialists familiar with Corregidor's defenses. Corregidor had significant quantities of weapons, ammunition, and scrap metal, and after interrogating the men about their role in the battle, they cleared out Malinta Tunnel and sent war materiel aboard Japanese ships. This view was probably taken in June 1942, since the roads are cleared and few bodies are evident. On July 2, all the Americans were moved to the Filipino Market, and the hospital was moved to Manila. On July 25, the prisoners moved to the old Station Hospital between Middleside and Topside. Sixty-six officers and men were sent back to Manila on September 4. Even thought they received Canadian and Red Cross packages, survivors reported that food was plentiful and easily found in the debris from the battle. American officers even buried weapons in case the Japanese should decide to massacre their prisoners. 191 officers and men were present on Corregidor for Christmas 1942. Lieutenant Colonel Kirkpatrick died of pneumonia on April 27, 1943. The camp was dissolved and the prisoners moved to Manila on June 8. When the Americans invaded Corregidor in February 1945, this whole area was bombed until nothing remained.